Title [People moving toward the tracks from the station toward an arriving train at the Chicago Burlington & Quincy railroad station in Berwyn, Illinois,] [graphic]. 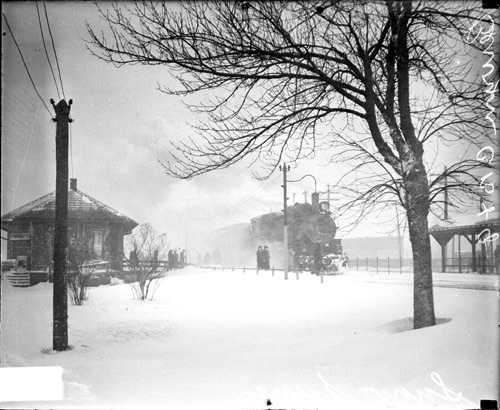 Collection summary View of a train stopping at the Chicago Burlington & Quincy railroad station in Berwyn, Illinois. A few people are visible through the snow as they are moving toward the tracks from the station. Railroad trains Illinois Berwyn 1920-1929. Geographic coverage Berwyn (Ill.) 1920-1929.